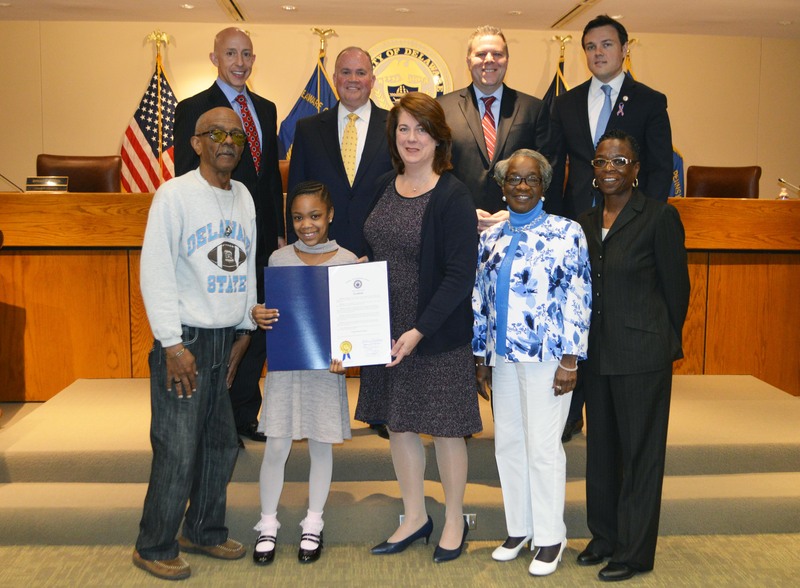 Delaware County Council recognized 9-year-old Cayla Davis-Clark during the March 20 council meeting and commended the young hero for her quick thinking and bravery, which saved her grandmother’s life. In February, Cayla’s mother dropped her off at her grandmother’s house on her way to work and watched Cayla walk through the gate. Cayla knocked on the door, but no one answered and the door was locked. Cayla suspected something might be wrong and climbed on a bench on her grandmother’s porch, climbed up the siding of the home and pushed through a window, feet first. Once inside Cayla found her grandmother, Joyce Ann Davis suffering from an aneurysm. Meanwhile, police were on their way after the window break-in had triggered an alarm. When police arrived, Cayla tossed the officers the keys to the house through the same window she climbed in through. Police made their way inside and Joyce was rushed to the hospital. Thanks to her granddaughter’s bravery and quick-thinking, Joyce Anne Davis was treated and was recently released and was able to attend the council meeting recognizing the brave efforts of her granddaughter. Council presented Cayla Davis-Clark with a resolution recognizing the young girl’s bravery and commended her heroic efforts.